Currently I'm strictly carrara. But I would like to take advantage of some of the features (mostly the flocking feature and ability to use a 3d mouse). Also, if use carrara and a different 3d program (say carrara and blender). What is your rationale and what pitfalls have you noticed? I don't intend to use the topic as a way to put down one app vs another... I just want to know your experience was. For flocking,.. have you tried the "point force" along with a Particle system,. this force can be animated, and you can adjust the strength and area of influence of the force over time. if you're thinking of buying a program just to use a 3D mouse,... fair enough. that's your money,.. your choice. What's your expected work-flow between different 3D programs ? Did you see PySwarm for Carrara? It's really getting cool! HitFilm2 Ultimate, and it's free version were mentioned here a while back. I followed the link and checked it out. It looked really cool! But when I asked myself if I could pull this off using Carrara, the answer is undeniably yes. So I guess it depends on how well you like to convert things via Export/Import routines to get stuff back and forth - so that you can have more software loaded. I have friends that have both Carrara and LightWave. So naturally, I went to NewTek and checked out what's going on. Impressive software - truly. I think that if I didn't truly rely on buying in my content so much, I might have been pulled in. Most of the stuff that can be done elsewhere can also be done in Carrara. I've learned this from 3dage and Mcguyver and several others. Cripeman is also pretty much on the "You can do anything in Carrara" front as well. Well since then I've found Dogwaffle Pro: Howler (Again? Really Dart?) which is truly amazing at working with small animation clips. I'll be doing some amazing tutorials on how we can use these two apps together to get lightning fast animation renders done. If you can transfer unrigged OBJ everything will be ok.... It seems like FBX should be the new and fancy format, but it actually is different in every program - and that makes no sense because it is a proprietary format so you'd think everyone would have to conform to one standard, but no. Every FBX is weirdly different. In some combinations you can transfer mesh and rig (mesh and texture if you are lucky). Carrara Pro can import LWO, but sometimes polygons get omitted. For animated meshes you can do Sequenced OBJ via plugins in Carrara, and also MDD. To answer 3Dage, I was going to use Carrara to arrange the scene, export meshes to Lightwave, rig, texture, animate and render at a cloud based render farm I'd prefer to do most of the work Carrara, but I'm not sure how much I can export. I've got the Lightwave demo so I'll post the a render of the exported results. I'm mostly interested because I can't find any render farms that work with Carrara. However, with the Octane plug in for Carrara I might go that route. The ironic thing is Lightwave would be cheaper than Octane because of my University discount. I'm also going to look at Lux plugin. I'll definetly take a look at pySwarm to see how that works. I also found out about the free Hitfilm 2 Express giveaway, but the promotion ended last month. However if you buy Sony Movie Studio Platinum Visual Effects Suite from Amazon you get their stripped down vegas editor, Hitfilm 2 express, music tracks and a DVD authoring program. You can then upgrade to Hitfilm 2 Ultimate for $269 if you want. Those that got the free Express don't get the discount. 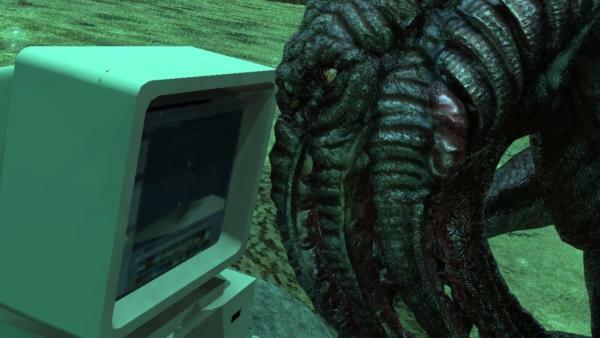 Attached is render I did using Luthbel's Cthullu and Dartenbach Under water realms. It's quick and dirty. Hat tip to you two. Since you mentioned getting the educational discount for Lightwave, you can get Octane Standalone for free via their recently announced educational program. That’s a huge savings, you just need to buy the plugin for your app of choice (Carrara? when it’s available). Too bad Carrara's atmospheres cannot be exported. I love Carrara. The atmospheres we can create, quickly and easily, can really make our images great. Underwater Realms EnvironKit relies on it for the underwater look... but you probably know that already. Interesting about the Visual Effects Suite. When I built my workstation, I was able to include the Platinum Suite (Slightly less $$$, incl. Vegas Movie Studio HD, Sound Forge Studio, and DVD Architect) for 33% less than buying it direct from Sony. So my Workstation was born with Windows 7 64 bit, Carrara 8 Pro, and Sony Vegas Studio HD with the extras. HitFilm 2 promo videos got me into rendering separate effects in Carrara, and painting them in Howler - animation over animation... really powerful and fun. It seems like FBX should be the new and fancy format, but it actually is different in every program - and that makes no sense because it is a proprietary format so you'd think everyone would have to conform to one standard, but no. Every FBX is weirdly different. In some combinations you can transfer mesh and rig (mesh and texture if you are lucky). Unfortunately this is true for many "standard" formats. Although FBX technically is not a public format they seem to have a done a good job about getting support for it into just about every major 3d app since they have a public SDK for it. Have you tried Autodesk's free FBX converter app? I honestly don't know if it would be helpful or not as I have not used it myself. Perhaps it offers better compatibility than what is built in to non-Autodesk apps? Thanks for the info,. that all makes good sense,. although I'm not sure if the lightwave route is significantly faster or better to justify the PITA of Exporting importing adjusting rigging animating etc.. when you could do it in Carrara. If you can get Octane renderer "Standalone" (through educational discount) for free, ..then when the Plug-in for Carrara is released, the need to export out of carrara to render in Lightwave. or anything else,.. becomes redundant. Octane should also allow you to render in the cloud. Carrara allows you to set up your own render-farm with the Render nodes, and there's also a plugin to extend that, but all that costs to set up and run,. so the cloud , (depending on price, and deadlines) could be a viable way to do final production rendering. Holly is right about FBX ... nice idea,.. but..!. and Collada is the same, they started as a great idea to produce an open and universal format for 3D exchange, but companies want you to buy "their brand", and stick with it,. so companies developed variations of the formats, to work with only their stuff,. and that breaks it all down to a joke that's not funny. OTOY who make Octane renderer, have just released a new format, (ORBX) which has been developed with Autodesk and Mozilla and is supposed to be an open exchange format for 3D scenes, between applications,.. but it also handles other media, such as video. It apparently holds all the scene information for everything,.. models, textures, animation, etc. It's also being rolled out onto Android tablets as a streaming format to handle real-time graphic stuff. I don't know a lot about it yet. ...but it sounds promising. and (If it works) it should get around exchange issues. I like that Cthullu model. Yes, a 3D mouse is awesome once you are used to it. I still reach for it in Carrara and then have to mutter a curse. Carrara still has a few pluses to it. Poser content of course. Volumetric clouds. Terrain. All of those are possible in LightWave but for me they are easier in Carrara. Still, DAZ's continued antipathy toward properly developing Carrara just makes it slip further and further behind. Sad. I like Carrara, but I agree with you regarding Lightwave. The more I learn about Lightwave, the more I like it. To get a better feel for how the animation workflow (IK Booster is already luring me in), instancing, texturing, etc.compares to Carrara's, I'm planning to use Lightwave in an upcoming animated short movie. Fenric's BVH/PZ2 Exporter for Carrara is useful to have if your going to be using Lightwave in compilation with Poser & Carrara. Since it adds some export options that are huge helps. I am wondering if Poser Pro 2014 is worth the price just to get my DAZ models/props into LW easily. Garstor it is worth it if you use Lightwave heavily and want to get your content in. Once you get used to it...wow...it really is amazing. The 3D Connexion site mentioned D|S supporting their product, but not Carrara. I also purchased Poser Pro to get the Poser Fusion plugin to use in Lightwave. Makes it easy to import Poser scenes including animated characters. You can manage the textures in Lightwave, but you must make character animation changes in Poser. Okay, so you have Poser Pro and LightWave. I keep wondering something. For my question, let's use V4 as an example. Let's say I have my V4 character all dressed with hair. If I get that character into LW, can I then animate her within LW without destroying clothing and hair conformity? Can I still use the INJected morphs within LW? Any thoughts Jay? I'd love to here more about content within LightWave. I love Carrara. But the silence from DAZ makes me nervous sometimes, which always draws my attention towards LightWave, whose developers seem to enjoy showing their development efforts to the community. I was kind of wondering the same thing about being able to edit the character and animation in LW. From the way it was written it sounds as if you need Poser as kind of a module. But then again, what's the difference between needing D/S to use Genesis in C8.5? Right. If it worked like I would need it to, then having Poser Pro as an added expense, especially coupled with its grand capabilities, would be totally justified to me. Like CyborgTy, I have been tempted by LightWave quite a bit. With the latest stuff that they added in the .6 uprade, along with... well... everything that LightWave is... it looks simply fantastic. Just some thoughts I guess. The fact remains that I absolutely thrive on how sweet Carrara is towards all of this, and being quite decent at all of its abilities, and the sheer wealth of abilities that it has. It's such a perfect CG Animation workshop for me, especially coupled with Howler, and all of the amazing plugins available, which is where I am currently aimed towards future workshop investments. Next steps would be upgrading Vegas Studio to Vegas Pro, and heading to the studio for pro audio recording. The couple grand that the LW/Poser route would cost me could go a long way in those areas. Very honestly, I like to test the programs in demo, but I never found only one which either so complete and having the user-friendliness of Carrara. I don't understand well why DAZ was obstinated with all to invest in Genesis rather than to remain with Carrara in the great 3d softwares, but I will remain faithful until the end! On the surface of it, Carrara is very friendly. Maybe it is my programming background, but there are a lot of "little things" that began to really bug me about Carrara. But I kept at it, I kept loving it. Then I started using LightWave. That sounds like LW is the be-all-and-end-all answer. NOT TRUE. LW takes a lot of getting used to and it has some frustrating aspects too. But nothing like the stuff that was bugging me about Carrara. Carrara's flaws are caused simply by lazy programming - not to slam DAZ_Spooky too much here, maybe the original code architecture prevents them from easily changing it. But that is the core problem for me. DAZ is simply not investing in improving/fixing Carrara. Sure, 8.5 tacks on a few nice things...but it doesn't fix the basics. Best example, something goes wrong in Carrara and you get a message, "An error has occurred." THAT'S IT! The only thing worse than that is crashing without warning. There is no information provided to the user to indicate what might have gone wrong. Sure, LightWave crashes sometimes...but it usually gives you a chance to save your work. Serious crashes that actually take down the applet you email NewTek with a crash dump report. My own debugging skills are rusty...but I sometimes wish DAZ would give me symbols and source code. That way, I could analyze crashes for all you good users out there who suffer these pointlessly useless error messages. I don't know how this Poser Fusion thing works. But knowing what I know of LW, I can guess that the answer is "yes." The temptation to buy this is very strong...but $500 is a lot of moolah when you are beating back a Debt Monster. I think I've nearly killed the beast though; so pretty soon I can start having fun again. To jump from a program to another, I do not like that, but I regularly use Poser for non-existent things in Carrara (Walkdesigner, clothes simulation…). Compatibility is good between the two programs. Other softwares have their qualities and capabilities but do not have a pipeline for Carrara and the aspect of the renders are not at all the same from one program to another, one could not create a film by making a mixture of renders in various programs (except with compositing). I believe that all depends on what one seeks, the facility, the quality, the animation of characters, technical animation… the field is vast and each one will find his happiness in one or another program. There are very few 3D softs which joins together all these qualities and Carrara still forms part of these. PS: Carrara don't crashe so often and sometimes one forces the closing by missing of patience! As I stated in my previous post, whatever you bring into Lightwave thru Poser Fusion must be animated in Poser Pro. Other than the overall character scale, rotation, and position, you don't directly animate the character in Lightwave (i.e. can't animate individual arms and legs). So if you create an animation in Poser Pro, you can save it to a pz3 file and import this directly into Lightwave (only after you installed the Poser Fusion plugin). You can then view the animated scene in Lightwave. If you need to change the position of an arm (for example), you must go to Poser and make the change there. After making the change, save the file and switch back to Lightwave. The change tends to get automatically picked up by the Poser Fusion plugin. When I played with this several months ago, I kept both programs opened and switched back and forth as needed. As I stated in my previous post, whatever you bring into Lightwave thru Poser Fusion must be animated in Poser Pro. See, for me, not being able to animate the figure directly in LW would be a deal killer. Not just because of not being able to animate a DAZ/Poser figure directly (that would be well over 50% of the reason), but the added cost as well. Carrara has its flaws. I won't deny it, but to have to buy LW, then buy Poser and maybe buy the plugin- well, that crap adds up fast. I don't see the advantage in the PITA factor Vs cost ratio. In my opinion, despite its flaws, Carrara still comes out ahead in ease of use and the extreme cost savings of doing it all in one place. I think if I were made of money, I wouldn't mind owning LW, but if I wanted to animate with a library of realistic humans, their wardrobe and accessories, other quality non-human figures and articulated vehicles. then Carrara would definitely retain a top spot in my workflow. That's enough for me right there. Thank you. Like DUDU, I like Poser (I have an old copy) for things - I really do. Animating is not one of them, except for that cool walk cycle window... I love that thing! You can do them in place, if you like, otherwise you start by putting a simple (or complex, whatever - but it's easy to do, is what I meant) path down in the scene. Select the figure and enter the walk designer. From there you choose from all of the Poser presets and other cycles you may have added along the way, like Nerd 3d's excellent walks. Set a few preferences and let Poser calculate your moves! Great tool! But getting Carrara was a magical bliss for me. I like everything better in here. "An Error Has Occurred" happens actually a lot less than other programs that crash without warning. That might bother me in the moment - but that's few and far. Probably something I did anyways. I have a friend, hwom I haven't seen around here in a long time... where is she? Oh... but she has convinced her company to try Poser and Carrara for their animation needs, and it ended up saving the firm a lot of time and money... well... same thing, right? But she was saying that, when it came to rendering, nothing topped LightWave, which the company already had. That statement always intrigued me. So I asked for further explanation, but I never seem to get one - from anyone. As it turns out, I love the way Carrara renders. I do. But then, I love the workflow within Carrara too. But she was saying that, when it came to rendering, nothing topped LightWave, which the company already had. That statement always intrigued me. So I asked for further explanation, but I never seem to get one - from anyone. I suspect that this is a rather fruitless argument. As you have stated (repeatedly ;) ), Carrara works for you. It fits your style and your goals. More power to thee sez I.
Yup. (And thanks to Ty for the clarification, I wasn't sure about that after reading Smith Micro's info.) I had Lightwave and Poser before I had Carrara. They all have their strengths, but Carrara is dramatically better than Poser for animation. And using Poser content directly in Carrara, with all the sliders, etc., sounds simpler than the Poser Fusion approach. My Lightwave is an older version, and I have not tried Poser Fusion, but Carrara just works for me. I do still use Lightwave stand alone for the occasional scene I find, it can be pretty impressive. And I still need Poser sometimes, like when the morphs don't work in Carrara (see my separate topic here in the Carrara forum). But those are the exceptions, the rule for me is Poser content in Carrara.